Rudra Marketing, along with the support of African Eden DMC, East Africa concluded a limited-edition familiarisation trip to Kenya for seven nights recently, covering Nairobi, Amboseli, Lake Naivasha and Masai Mara. 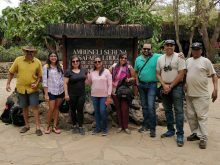 Nikita Rawtani, Founder, Rudra Marketing and Rajiv Chadha, Managing Director, African Eden, were a part of the trip, along with five agents from Mumbai, Pune, Surat and Bengaluru. The exclusive trip was targeted at travel agents who sell luxury and experiential travel with an inclination to learn and sell a destination known for adventure and wildlife. The hotels were carefully shortlisted specially, Chui Lodge, Naivasha which topped the list. It is set in the heart of a private 18,000-acre wildlife sanctuary and is nestled in an indigenous forest overlooking the Mau escarpment. Other hotel visits included Tamarind Tree, Amboseli Serena Safari Lodge, Amboseli Satao Elerai, Mara Simba Lodge, LOYK Mara Camp, and the Windsor Golf & Country Club. Highlighting the experience, Rawtani said, “Chui Lodge is Naivasha’s best-kept secret. This all-inclusive lodge has everything one can ask for and the food is a gastronomic delight. The morning and evening game drives, sun-downers, flower farm visit, bush breakfast and the boat ride arranged by Chui Lodge was an experience that will last for a lifetime. We plan to create many such enriching experiences for the travel agents by conducting subsidised Fam trips and give them hands-on-experience about the destination.” The agents also visited the Giraffe Centre and David Sheldrick Elephant Orphanage followed by an orientation and shopping tour in Nairobi. Besides, there were several game drives and hotel inspections throughout the tour.